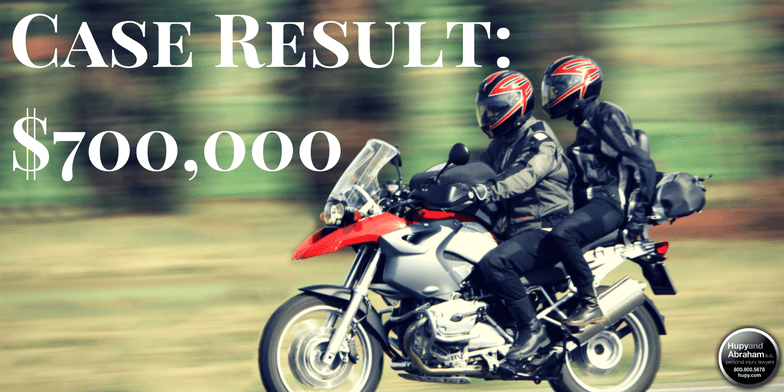 $700,000 for Injured Motorcycle Passenger | Hupy and Abraham, S.C.
Hupy and Abraham's Wisconsin client was riding as a motorcycle passenger in McHenry, Illinois. After a long weekend of riding, the client and her relative were returning to a loved one's home when they were rear-ended by a careless motorist while turning right. She sustained head injuries and experienced residual back and hip pain from the accident. The insurance company opened negotiations with a low-ball $250,000 offer. Attorney Vito Manicioto filed a lawsuit to move the case forward, and ultimately obtained $700,000, nearly three times the original offer.